If you are expecting twins, first off, congratulations! You are about to embark on an incredibly difficult, yet equally rewarding and joyful journey. I’m going to talk today about tips for feeding twins. You probably have a fairly strong opinion on whether or not you want to formula feed or breast feed. I want to tell you right away that you need to give yourself grace when it comes to breastfeeding. If it’s something you are passionate about and want to try (like I was!) there are so many factors that could make this not possible. The point of my post is to give you encouragement and tips if it’s something you desperately want to work, but also to beg you to give yourself a break if the struggle to breastfeed becomes too much. You definitely want to feed twins at the same time. If you feed one, feed them both. Yes, this means you wake a sleeping baby. Use different colored bottles for your twins. They might end up having different allergies or needing different medicine, and if you start from the beginning you will be used to which baby gets which color. For nighttime feedings, bring everything into your bedroom. Use a cooler or get a mini fridge to keep milk cool and bring the bottle warmer (or get an extra one!) into your bedroom. Prop the bottles. You might receive some backlash from other moms for doing this, but you gotta do what you gotta do. I propped my girls in the Twinz Pillow. It is a double nursing pillow, but it is also essentially a double boppy. You can also just use two boppies or put them in a bouncer, swing, or car seat. I would prop their bottles and make my toddler breakfast and get him ready for pre school. Then, when they were done with their bottles, I was free to play and interact with them. If you are choosing to formula feed, or are formula feeding because breastfeeding didn’t work out, you are not alone. Don’t let the slogan “breast is best” make you feel guilty. Nobody can make the decision other than you, and your mental health counts! Breastfeeding multiples can be challenging and forumula is 100% OK.
Read about Christine’s journey with breastfeeding and why she ultimately chose to formula feed here. My firstborn was mainly breastfed, but he did receive some bottles of pumped breastmilk and eventually formula. He drank it cold, straight from the refrigerator. I thought bottle warmers were silly. Why have an extra thing sitting around my kitchen? Why get him used to warm bottles at home and then have to deal with warming them when we were out and about? When my twins were in the NICU and we were preparing for them to come home, I realized I was going to have to change my ways about warming bottles. Not only did they get used to having warm bottles in the NICU, but they were both under 5 pounds when they came home. I didn’t feel right giving this tiny preemie a cold bottle. This is just another example of how things are so different for twins and singletons and how things can go completely NOT according to plan. I repeat. Prepare it in advance! This can be done many ways. Prepare all of the bottles in advance and leave them in your refrigerator. Cons: Lots of bottle washing; lots of bottles to OWN. Still need to warm bottles. Use a formula mixing pitcher to make a batch of formula in the morning and fill bottles as you need them throughout the day. Pro: You can rinse the bottles after and store them in the fridge with the cap on. Then only wash two bottles and the pitcher at the end of the night. Cons: Still have to warm bottles. Use a Baby Brezza Formula Dispenser. My pre-twin self is reeling in shock that I am actually suggesting such an extravagant thing. Like I said, things change when you have twins! I have not used this personally but the reviews from other twin moms I have talked to are amazing. Apparently, it’s life changing. Pros: no heating bottles. Rinse and store bottles in the fridge after use and only wash two bottles at the end of the day. Bottles are perfectly prepared in under 30 seconds, at the perfect temperature, just above room temperature. Cons: You have to clean it, but it is supposedly very easy. You also can’t use it for if you have one baby with an allergy. One of my girls had a dairy allergy and had to be on soy formula, so I wouldn’t have been able to use the Brezza for both of them. Breastfeeding is something that didn’t work for me. You can read more about my journey here. 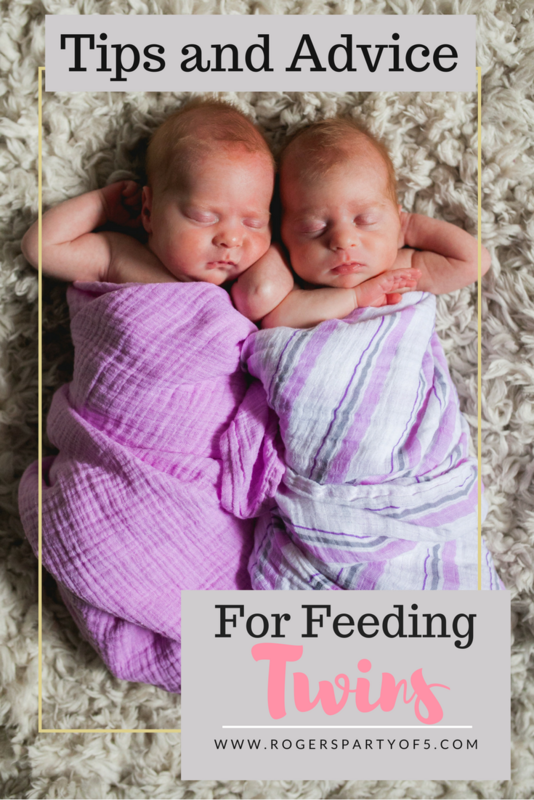 Here are some tips that I have learned from twin moms who were successful at breastfeeding. Request to see a lactation consultant at the hospital, and have the information for one who makes home visits readily available when you go home. Start nursing them one at a time. Once they have mastered nursing for a few weeks, then attempt tandem nursing. Eat and drink a LOT to help keep your supply up. Invest in a twin breastfeeding pillow. There are two great ones, and the twin mom community seems pretty split about which one is best. The My Brest Friend (I know the name is SO bad) pillow seems to be more popular for breastfeeding moms. The TwinZ Pillow can also be used for tummy time and bottle feeding. I had both of them (bought them used from twin moms, which I highly recommend… simply wash the cover!) and I used the TwinZ for bottle feeding my girls. This was my life for 9 months. Most women don’t decide from the beginning that they want to pump exclusively. It’s usually a decision that’s made when nursing isn’t working, but the mom still wants to provide some or all breastmilk. Don’t wash your pump parts after every pumping session. Here’s a link from CDC on how to properly clean your breast pump parts. They specifically say that you must wash them every time that you use them. Here’s my reasoning for not doing that. If you are pumping every 3-4 hours, that is a LOT of washing. You’re probably not washing them properly each time. In my opinion, it’s better to wash them properly one time, handle them with very clean hands, rinse them when you are done, and store them in the refrigerator in an airtight bag. Breast milk can last for several days in the refrigerator, so as long as you’re washing your hands before each use, you won’t have a problem. Just make sure to wash them really well at the end of the day, and also definitely wash them if they are left out. I also used these steam bags to sterilize them every other night. Invest in a hands-free pumping bra . The link is to my favorite one, because it is adjustable and fits all different sizes. Pump while you are feeding the babies. I know this feels awful because you want to be holding them, but when you have two babies and are also pumping, you have to cut time somewhere. I used to pump and feed them at the same time especially at night when I didn’t want to be interacting with them. During the day was more challenging, as I also had a rambunctios two-year-old to care for. If you are expecting twins, or parenting newborn twins, I hope this post is helpful and encouraging to you! What are you most nervous about or what has been your biggest challenge in becoming twin parents? Let me know in the comments! Follow me on Facebook, Pinterest, and Instagram for more things twin related!